Lancaster used a season-high 17 hits to beat Inland Empire, 9-1, for a sixth-straight win at The Hangar Thursday night. The JetHawks have evened their record after starting the year with six losses in a row. Ramon Marcelino led the way with a pair of home runs and a double. He now has four home runs, putting him in a tie for the league. Matt Hearn and Carlos Herrera each had four hits in the victory as well. Lancaster (6-6) jumped in front with four runs in the first inning, and the JetHawks did not look back. Ryan Vilade drove in a pair with a single in the opening frame. In the second, Marcelino led off with his first of two home runs. He reached in each of his four plate appearances Monday. He launched a booming home run over the protective netting in right field with one out in the seventh inning. 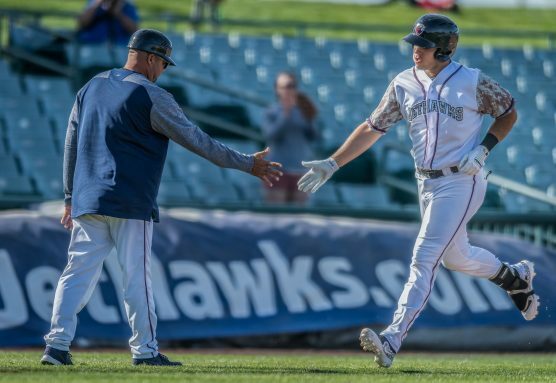 Austin Bernard followed with a solo shot of his own, giving the JetHawks back-to-back home runs for the first time this season. Will Gaddis (1-1) earned his first win of the season, pitching 5.2 scoreless innings in his third start. Moises Ceja and Hunter Williams combined to finish the contest. Inland Empire (5-7) scored just one run, the fewest allowed by the JetHawks in a game this season. Alvaro Rubalcaba homered in the top of the seventh, but the 66ers scored no more. Starter Cooper Criswell (0-1) allowed six runs in three innings on the mound for the visitors. After starting the season 0-6, the JetHawks have evened their record at 6-6. Monday’s game was the first nine-inning game to take fewer than three hours this season. Lancaster goes for seven wins in a row Tuesday night. Righty Garrett Schilling (1-0) takes on Inland Empire’s Kyle Bradish (0-1) in game two of the series at The Hangar. First pitch is set for 6:35 pm.